On 28th July 2018 the Daily Mail published a double-page spread about a French suburb “teeming” with “up to 300,000 illegal immigrants.” The piece, titled ‘POWDER KEG PARIS’, suffered an in-depth dismantling on Twitter by the former director of the Association Against Islamophobia in France, Marwan Muhammad. Today, 6 months later, a correction was published. After Miqdaad Versi of the Muslim Council of Britain first complained the original article was removed online. 6 months later, the Daily Mail has finally been required to acknowledge 8 serious inaccuracies. The correction, which is featured in small box whereas the original story was a double page spread, finishes with the words “we apologise for any confusion” – and fails to apologise for the repeated inaccuracies throughout the piece. “If you looked up the dictionary definition of when the punishment doesn’t fit the crime, you should find this appalling saga. 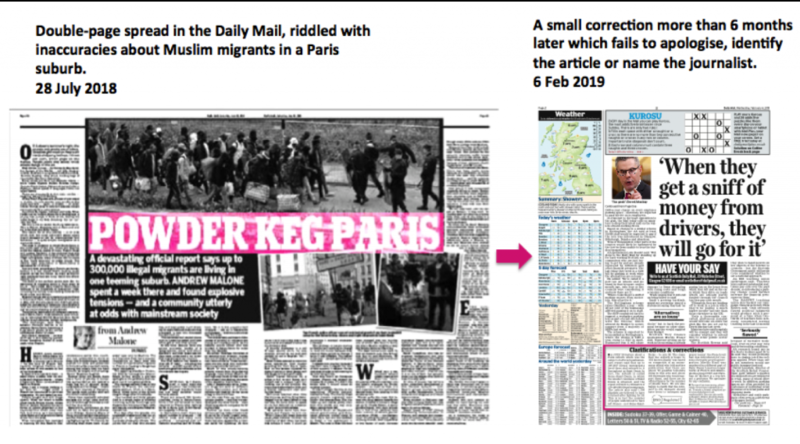 “After publishing a woefully inaccurate double page story that fomented racist, anti-migrant and Islamophobic sentiment, 6 months later, the Daily Mail issues a tiny correction. Should the punishment not fit the crime? “And where is the regulator? It has taken 6 months to even get this paltry correction.